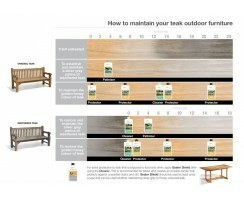 Look after your garden furniture with the right products that won't damage it over time. This teak sealer shield will make your teak furniture dirt and water repellant, helping to protect your teak furniture from dirt, food and wine stains. 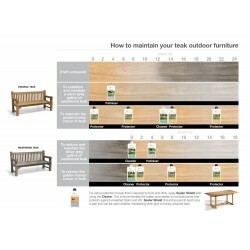 Our Teak Care products are specially designed to enhance the natural qualities of teak. 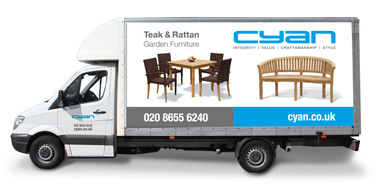 Teak is wonderfully low-maintenance and, at the very least, will only need occasional cleaning with warm, soapy water. However, should you wish to restore and maintain teak’s honey colour, or establish a silvery-grey patina, our Teak Care products will give a much more natural and long-lasting finish than teak, Tung and other oils without causing black spots. Our teak sealer shield will help to make your teak wood furniture water and dirt repellent and is suitable for both indoor and outdoor furniture. The teak shield is a water-based, barely visible wood impregnator that makes it difficult for wine, olive oil, butter, or coffee to seep into teak. This ensures that after a meal your teak table can be simply wiped with a damp cloth without any unsightly stains remaining. This 1 Litre bottle will cover approximately 7 sq. metres, and includes a soft cloth.